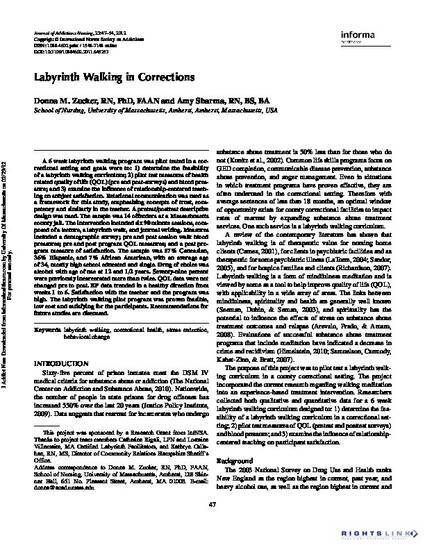 A 6 week labyrinth walking program was pilot tested in a correctional setting and goals were to: 1) determine the feasibility of a labyrinth walking curriculum; 2) pilot test measures of health related quality of life (QOL) (pre and post-surveys) and blood pressure; and 3) examine the influence of relationship-centered teaching on subject satisfaction. Relational communication was used as a framework for this study, emphasizing concepts of trust, competency and similarly in the teacher. A pretest/posttest descriptive design was used. The sample was 14 offenders at a Massachusetts county jail. The intervention included six 90 minute sessions, composed of a lecture, a labyrinth walk, and journal writing. Measures included a demographic survey; pre and post session walk blood pressures; pre and post program QOL measures; and a post program measure of satisfaction. The sample was 57% Caucasian, 36% Hispanic, and 7% African American, with an average age of 34, mostly high school educated and single. Drug of choice was alcohol with age of use at 12 and 1/2 years. Seventy-nine percent were previously incarcerated more than twice. QOL data were not changed pre to post. BP data trended in a healthy direction from weeks 1 to 6. Satisfaction with the teacher and the program was high. The labyrinth walking pilot program was proven feasible, low cost and satisfying for the participants. Recommendations for future studies are discussed.